Well, yes, thank-you, I know that, but cabbage keeps forever in my vegetable bin; and sometimes I forget I have it, and am lured by the pretty colors at the Farmer's Market and buy even MORE cabbage, which I then forget to use, and so it goes. Anyway, I had four heads of cabbage waiting for me this morning! 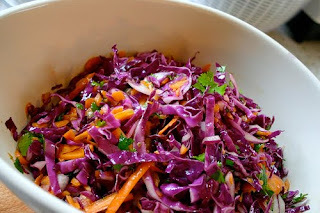 So today, the day AFTER the 4th, I'm using up a bunch of that cabbage and making one of my favorite picnic salads. Sweet-Hot Thai Coleslaw. I love the bright colors as you assemble this salad, the purple cabbage and orange carrots especially, are such a pretty contrast! 1 or 2 jalapeno chiles, minced or to taste, as hot or mild as you like! 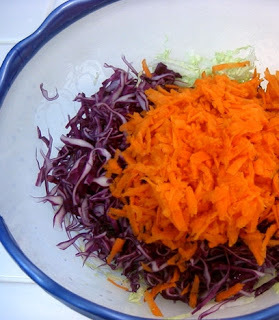 1/2 hour or so before serving, put the cabbage, carrots and red onion into a large bowl and mix together. Pour the dressing over, toss again, cover and refrigerate. To serve, toss the cabbage mixture in the dressing and put on serving platter. Add half the cilantro, toss with tongs and scatter the remaining cilantro on top. SO refreshing!! I could eat this stuff for days on end, but it never lasts that long! It gets a little "wilted" and juicy the second or third day, but it is still really good! Oh, and it's GREAT in a taco shell with crispy tempeh too! I prepared this salad today and it was delicious, thanks for sharing this recipe! It is a keeper!